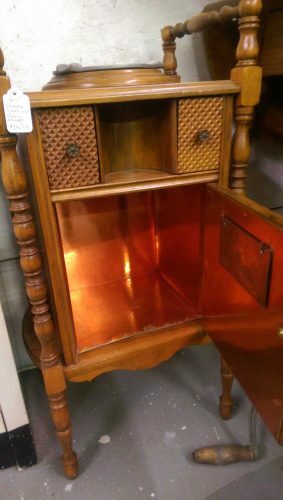 An incredible vintage smoking table, smoke stand, or standing humidor — still with the original copper liner! But it’s the outside the fabulous outside details which really make this a standout vintage piece. 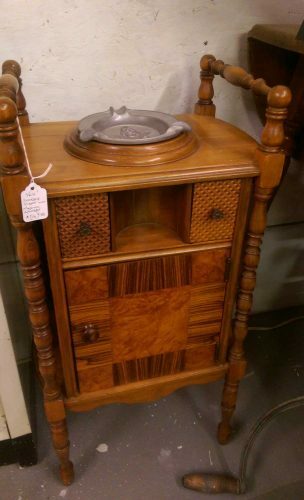 Lots of parquet, turned legs and spindle side handles, little storage spaces… A very handsome smoking parlor piece. The ashtray which sits on top of the stand bears the Masonic square and compasses, with the center “G”. 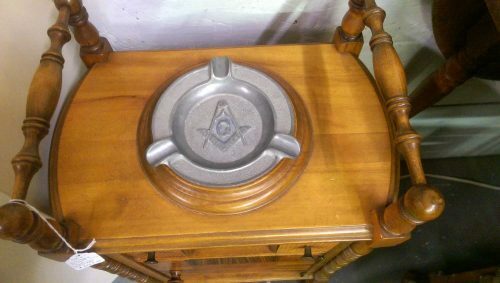 While the Masons ashtray was found with the table, it’s not original to the piece or was in a Freemasons lodge or Masonic member’s home. Still, a very beautiful and intriguing piece! 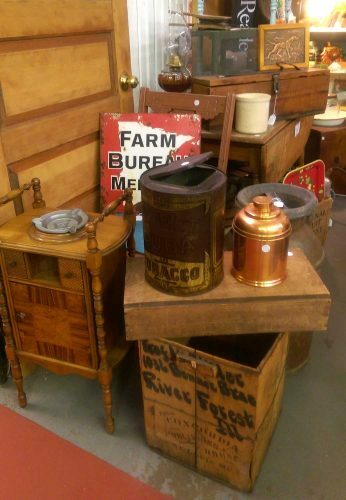 It currently sits in our space at SuLaine’s antique mall, Detroit Lakes, MN. If interested, contact the shop (218-844-6830) or contact us; we will ship! 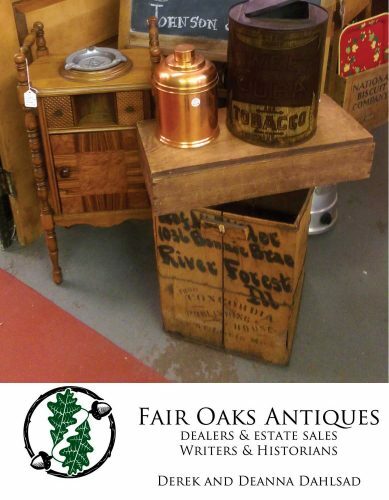 For details &/or more info on other pieces shown with this vintage smoking stand: vintage double-sided metal Minnesota Farm Bureau Member sign; a vintage wooden crate used to ship books to a Professor in River Forest, Illinois, from Concordia Publishing House of St. Louis, Missouri; and antique Sweet Cuba Tobacco tin & antique antique copper cigar humidor.